Good things come in small packages, and your petite pup is no exception. 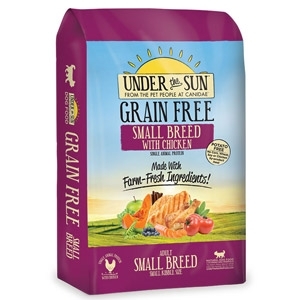 Our CANIDAE® Under The Sun® Grain Free Small Breed Dog Food With Chicken is made with high protein chicken meal for great taste your small dog will love. Chicken is the single animal protein used in this dog food recipe formulated specifically for small breeds. We also use a variety of farm-fresh fruits & veggies like green peas and blueberries. Our dog food recipes never use corn, wheat, soy, or chicken by-product meal. Reward your loyal companion with great tasting grain free nutrition!